You are here: Home / Blog / Is Blogging Helping Me To Build Up My Business Immediately? Is Blogging Helping Me To Build Up My Business Immediately? Practically speaking it is true for some small business owners which has been established their business for quite sometime. But I personally do not think that it is an effectively way for new starting business owner who want to get traffic in no time. As I wrote an article earlier, a lot of local busines owner want to get the result immediately by using newspapers advertising, radio broadcasting and other old school methods. In my opinion, marketing via blogging strategy is added beneficial to attracting more traffic and customers for established businesses. Before you plan to use blogging platform to build up business and branding, you should first evaluate your business first and stick to a plan. 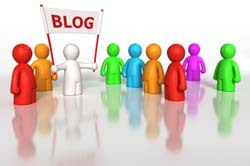 Getting traffic to your website thru Blogging take times if you think you can wait and experiment the new technology. Remember, blogging requires the above mentioned 4 key elements in order to get success. I am still consistently publishing my health care articles on my blog site. As of now, I have over 200 articles in my blog site. Remember to come back soon for more.